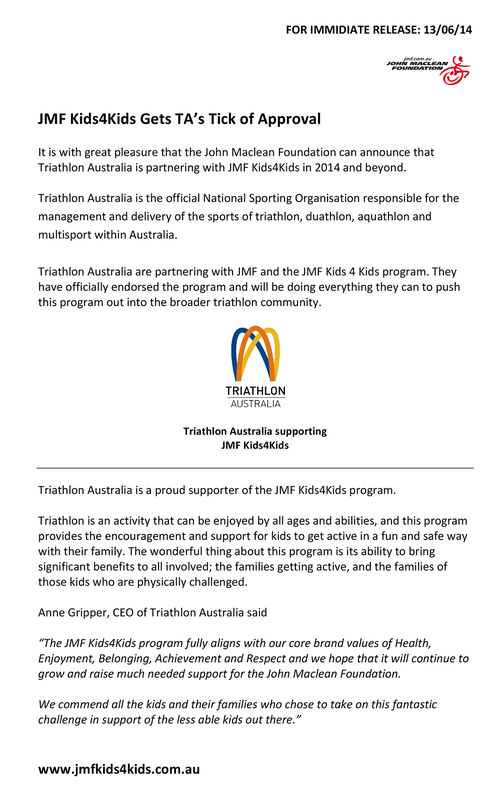 [vc_column_text]JMF Kids 4 Kids is designed to enable children and their families to ‘get active’ and swim, bike and run a little every week to raise money for young Aussies in wheelchairs. Every family involved participates over a 12, 8 or four week period tracking their progress and working together to achieve the 3.8km swim, 180km bike ride and 42.2km Ironman distance triathlon over the time period they select. At the end of the program the money raised in each state goes to Kids in Wheelchairs who are in desperate need of equipment that enables them to remain active and included in everyday life. All participants are invited to the Grant giving night where you can meet the families and children you have helped with the money you have raised. Each Registered participant is receives a Finishers Medal and T-Shirt presented by John Maclean on the night.